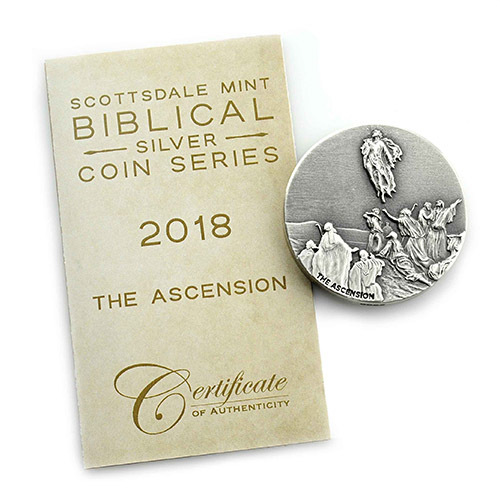 Scottsdale Mint introduced a stunning collectible series of silver for sale in 2015 when it the Biblical Coin Series debuted. With five new designs each year depicting scenes from the Bible, this collection boasts low mintage figures and distinctive packaging. The 2018 2 oz Ascension of Jesus Biblical Silver Coins are currently available to you for purchase online from JM Bullion. 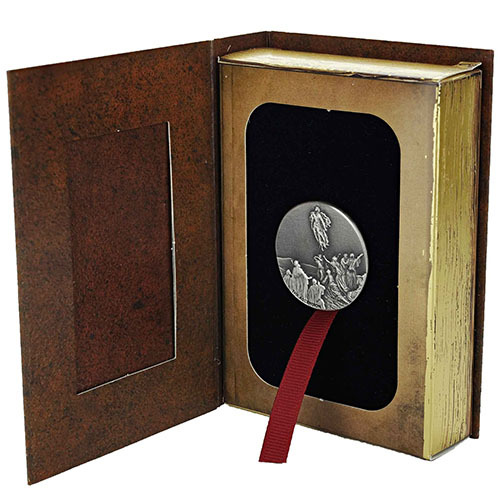 Coins arrive inside of protective Bible-themed display box with a Certificate of Authenticity! 5th and final issue of 2018 and the 24th overall in the series! Issued a face value of Two Dollars (NZD) by Niue. On the obverse of Queen Elizabeth II. The reverse includes the scene of Christ ascending into heaven to be at his fathers side. High-relief designs with rimless blanks. The Biblical Coin Series from the Scottsdale Mint features gorgeous attention to detail from design down to the packaging. The coins are struck in high relief on rimless blanks. The high-relief strike brings each design to life with greater 3D detail. Struck on rimless blanks, the Biblical Coin Series also includes an antique polish that enhances the sense of old-world coinage. On the Certificate of Authenticity included with your purchase today are the lines from Acts 1:9-11. This passage states that he was taken up into a cloud while they were watching and they could no longer see him. This refers to the moment days after Jesus rose from the dead when he ascended into heaven to join his father at his right-hand side. 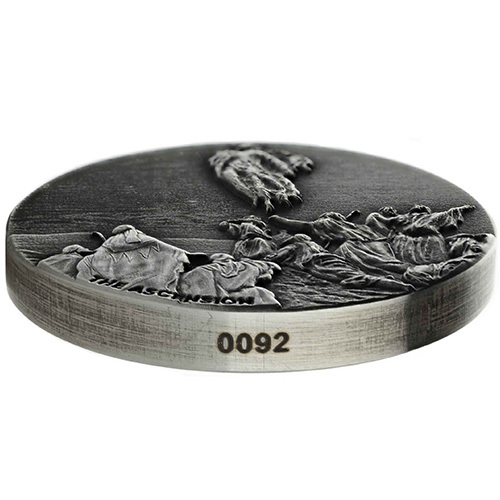 The reverse of the 2018 2 oz Ascension of Jesus Biblical Silver Coins includes Gustave Dores depiction of Christ rising into the clouds as a crowd of followers looks on from below. Dore completed his collection of biblical works of art in the 1870s and each one appears as the reverse design for this collection. 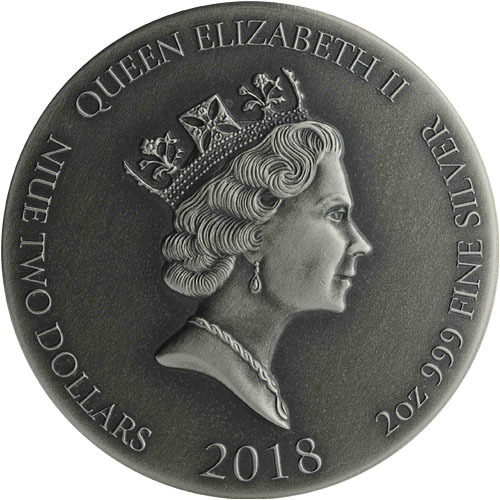 On the obverse of 2018 Ascension of Jesus Biblical Silver Coins is the image of Queen Elizabeth II. This collection uses the third-generation profile of Queen Elizabeth II created in 1984 by Raphael Maklouf. This design is considered the most ornate in the series of portraits of Her Majesty on British and Commonwealth coins. 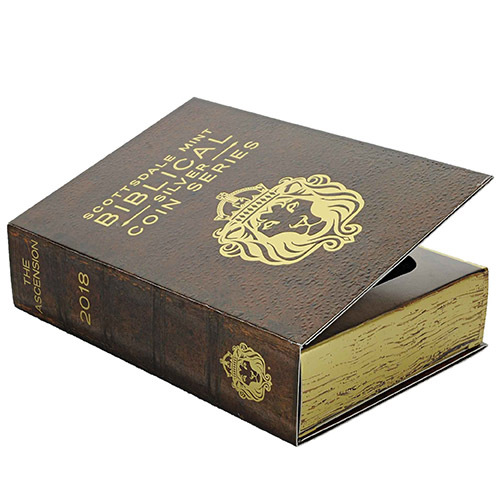 All coins in the Biblical Coin Series are shipped by the Scottsdale Mint inside of Bible-themed display boxes that feature a numbered Certificate of Authenticity with the bible verse describing the scene on the reverse of the coin. Further, the coins in this series feature individual serial numbers engraved on the edge of the coin. We encourage JM Bullion customers to call us with questions at 800-276-6508. You can also connect with us live online through our live chat and email address features.